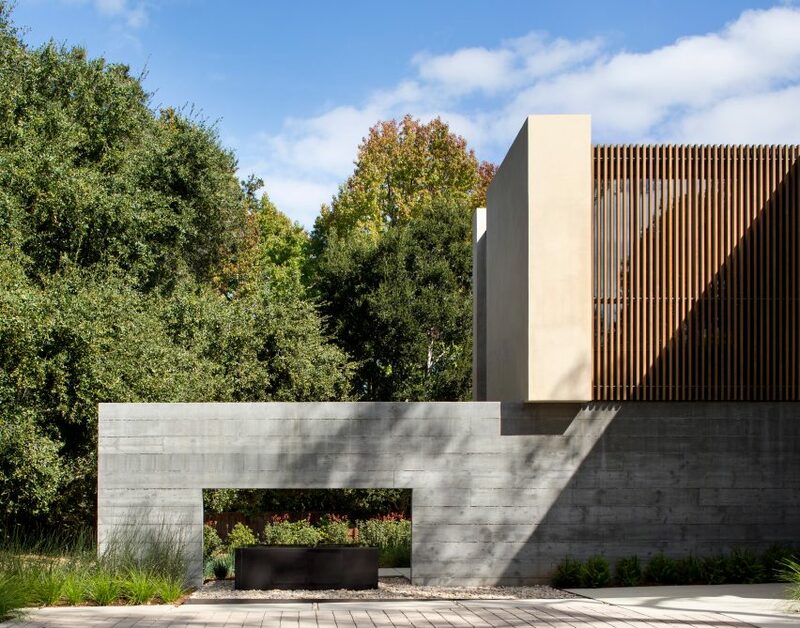 San Francisco firm Arcanum Architecture has organised the massing of this large home around trees overhanging a broad lawn. 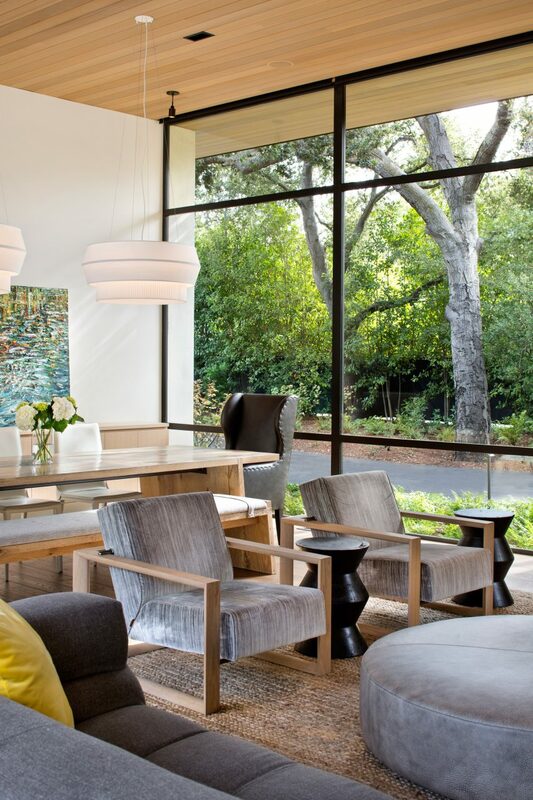 The residence is situated in the Northern California town of Atherton, where the site takes up the corner of a broad avenue and a side street. The long home, named Atherton Avenue, bisects the two-acre (0.8-hectare) property into a driveway spanning the southwest facade, and a spacious garden behind. “This unique parcel allowed for access points to the site to be moved off of the main roadway, which along with the landscaping, provides enhanced privacy,” said Arcanum Architecture. Four volumes staggered along the centreline make up the structure. A passageway connecting the separated spaces begins in the atrium, where it extends northward to accommodate a pair of bedrooms and bathrooms in the first protrusion of the plan. A staircase leads up to a private lounge and two additional bedrooms for children. Further along the hallway, an entertainment space occupying the second volume buds off to the south. The corridor ends in the third section, occupied by a kitchen and living room. A pocket door hidden in the south corner of the room leads to a private work area, including a craft space, a study and a mechanical room. A staircase extends the section into an additional study and gym on the level above. A covered patio following the working suite interrupts the sequence of indoor spaces, which resumes again as a detached garage making up the fourth volume at the structure’s east end. Through “various finish materials [that] carry through from the exterior to interior”, the architects aimed to create a fluid transition between the outdoor and indoor spaces. 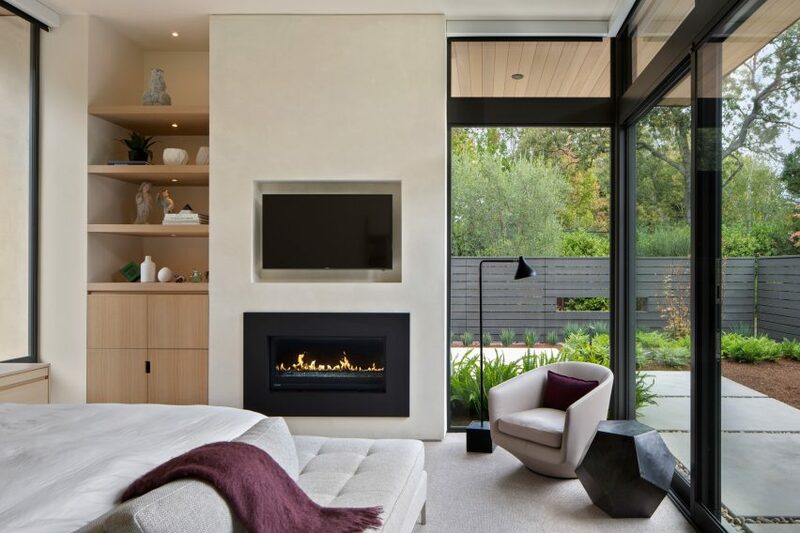 Stucco dominates the internal surfaces as much as the external facades. Mid-toned wood used for exterior louvres also lines parts of the floors and ceilings, as well as millwork finishes. Concrete elements supporting the building are revealed both inside and outside the structure. In the kitchen and breakfast room, an exposed concrete pillar resting between broad windows visually cools the otherwise warm and bright interior. 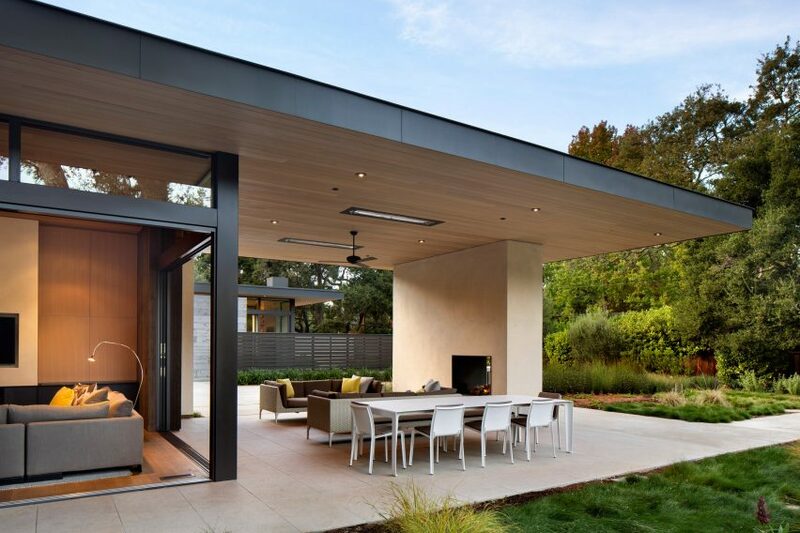 “The extensive use of glass, with large sliding and pocketing doors open into protected landscaped areas that allow for connection to nature,” they said. The outdoor space begins as a courtyard bordered by the disjointed indoor components, unifying them through a shared mutual space. The patio continues along the rear facade, wrapping around the kitchen and lounge area. A boardwalk traverses over shrubby grass and bushes, leading to the pool and broad lawn at the east end of the property. 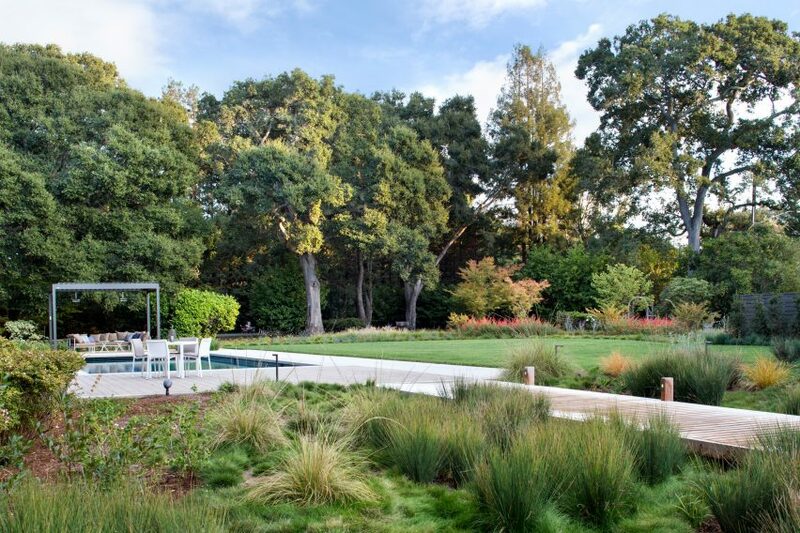 Throughout the garden, the architects sought to conserve the native flora of the site and highlight trees already present on the site. “The site contains many existing large trees and foliage which were not only preserved, but became interesting focal points as the building’s various masses were situated around them,” the architects said. 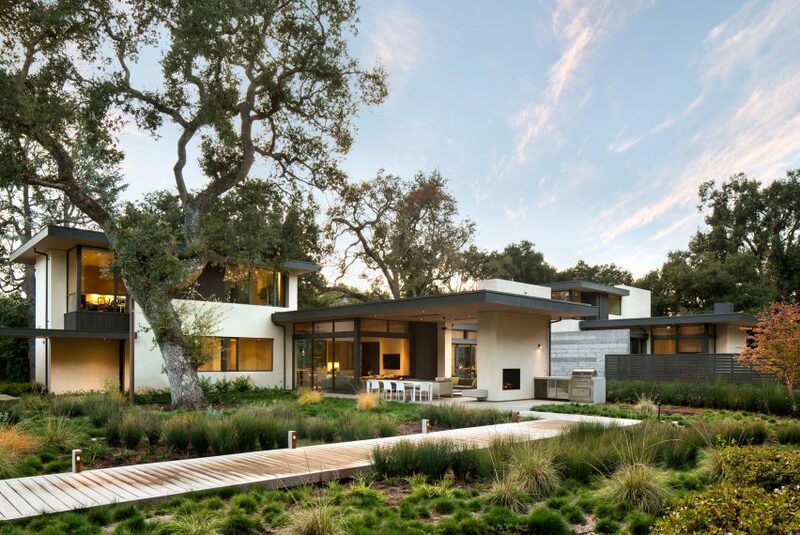 Northern California is home to several other woodland properties, including a low-slung residence featuring a meditation garden and a holiday house in the Sonoma wine region.